Share the inspiration of symphonic music with your family this season during the Seattle Symphony’s Classical King FM Family Concerts. Imagination is one of our most powerful tools. It allows us to bring stories to life, visit distant lands and come up with new ideas. Imagination is the root of empathy, helping us understand each other and conceive new possibilities. 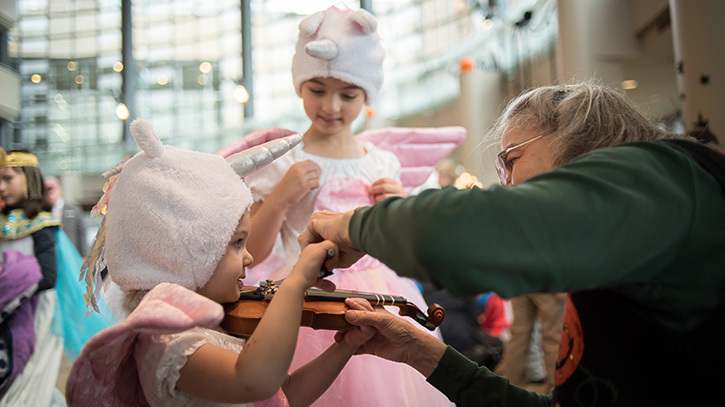 This season, share the joy of imagination with your family as the Seattle Symphony explores fairy-tale worlds and meets enchanting characters during the Classical King FM Family Concerts. From timeless musical stories to holiday favorites, these concerts will delight and spark your imagination throughout the year! The first concert of the season, October 21, features music from Igor Stravinsky’s ballet, The Firebird, which tells the story of Prince Ivan and a beautiful, rare bird whose feathers flicker like fire. The program also includes two Halloween favorites: Mussorgsky’s A Night on Bald Mountain and Grieg’s “In the Hall of the Mountain King” from Peer Gynt. Additional concerts this season include Raymond Brigg’s children’s book The Snowman on December 2 with the Seattle Symphony performing Howard Blake’s memorable soundtrack while the animated classic plays above the orchestra. This spring features two more stories, beginning with The Story of Babar, the little elephant, on February 24. The program features the playfully orchestrated music by French composer Francis Poulenc paired with Maurice Ravel’s charming Mother Goose Suite. The series concludes with the story of Shakespeare’s most famous star-crossed lovers in Sergei Prokofiev’s Romeo and Juliet on May 5, featuring ARC Dance Company. Purchase tickets for the Seattle Symphony’s Classical King FM Family Concerts and share the joy of music with your family this year!